There’s a new bicycle accessory in the house. In response to my son’s requests for an opportunity to pedal, we got a trailer-bike. 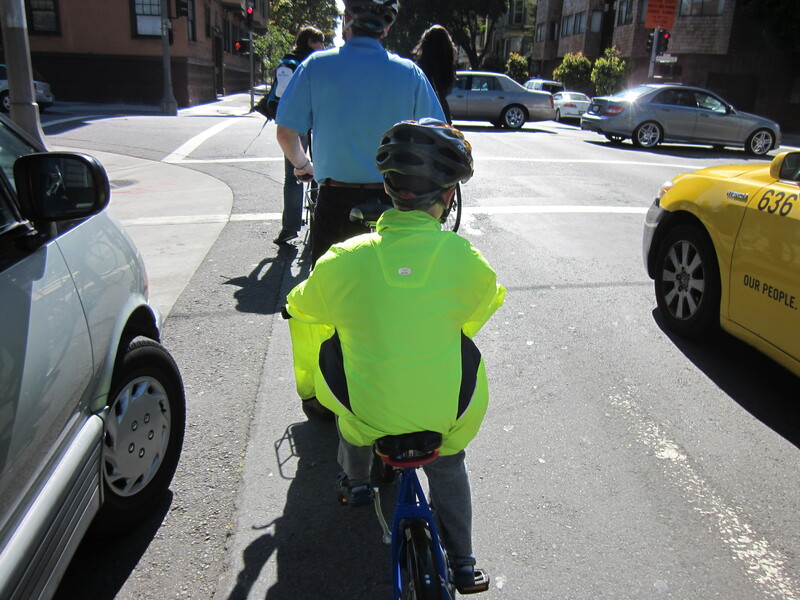 Technically he’s old enough to ride by himself, but given the traffic and hills around San Francisco, none of us felt ready for that. Although we saw the promise of trailer-bikes early-on, we had difficulty finding one we liked. The ones that mounted to the stem of the adult’s bike (Adams Trail-a-Bike, Weehoo) were unstable in both our personal experience and in other parents’ more harrowing experiences. And we couldn’t mount a rear child seat over one (ditto for the Trail-Gator). The Burley Piccolo mounts solidly to a custom rack, but the knob-mount is huge and meant that again we couldn’t mount a child seat over one—or for that matter, use the top of the rack. The FollowMe tandem looked more promising, but reviewers noted it was extremely heavy even without the bike attached, making it tough to go up hills—not that it mattered, as word from the only US distributor of the FollowMe tandem, Clever Cycles (Portland), was that they were out of stock and would be for the foreseeable future. I don’t remember where I heard about the Roland add+bike, but when I did I noticed two things right away: first, it mounted to the rack, like the Piccolo, which made it more stable. Second, the mounting point was nearly flat and sat at the end of the rack, making it possible to mount a child seat for our daughter over it and to use the entire rack, like the FollowMe. It cost a little less, in US dollars, than a Piccolo. The downside, and this was a big downside, was that it was only sold in Germany. But fortune smiled. Ever since high school I have had a good friend in Munich, Oli. We were, by coincidence, exchange students in each others’ high schools. One month after I learned about the Roland, Oli wrote to say he was visiting San Francisco to complete an audit, and would we like to meet while he was in town? I asked him if wanted to stay with us and if he’d heard of the Roland. He had. He said he’d love to stay with us, as his company was blanching at the cost of hotel rooms in San Francisco, and in return he’d be delighted to bring us a Roland add+bike from Munich as one of his checked bags. Win-win! 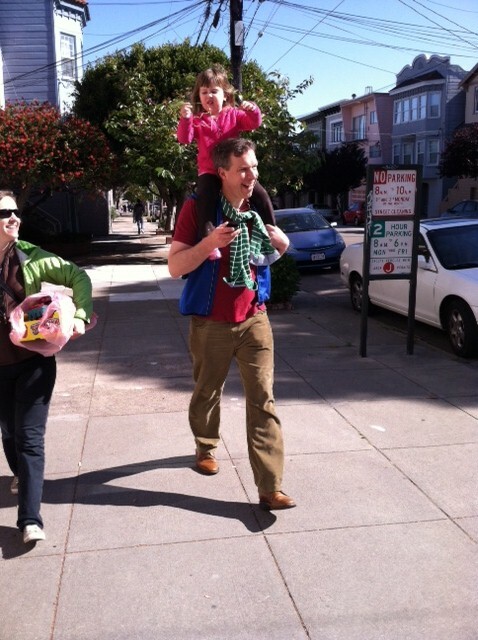 Our kids were thrilled to have someone so tall to carry them around. Oli, as it happens, loves bikes as much as we do. He and his wife imported their own Bakfiets from the Netherlands to Munich for commuting with their three daughters. “We call it… the FERRARI!” Within a week, he’d found us a used Roland add+bike and its custom rack on German eBay for the unbelievable price of 77 Euros. It was a single speed model. (The Roland also comes in 3-speed and 7-speed models, both of which have internally geared hubs! On a trailer-bike!) But for that kind of savings we could live without gears. Oli said that used Rolands are cheap in Germany now because the fenders and chain guards are made of plastic, and everyone is concerned about potential BPA exposure. I was so thrilled that the trailer-bike came with fenders and a chain guard—totally non-standard in the US—that I was willing to tell our kids not to lick the parts. Also: unbeatable value! Up, up, and away! Matt needed the car to catch up to us on this hill. The Roland rack is the custom rear rack we fitted on the Breezer when upgrading a half-dozen other things. Our bike shop complained that this was, ultimately, not a particularly easy job. But it totally worked. 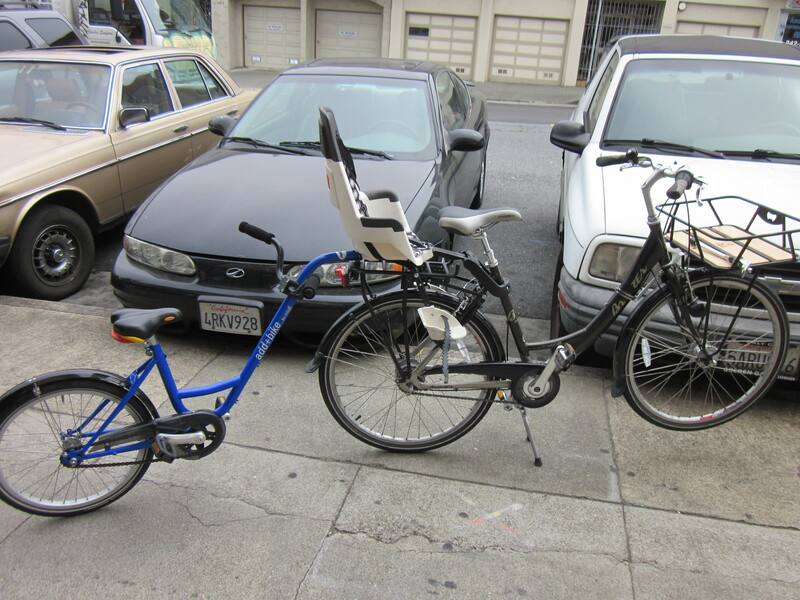 When we picked up the Breezer, we brought the Roland with us and built a giant articulated bike right there on the sidewalk: Breezer+Bobike Maxi+Roland. After the bike shop adjusted the handlebars to our son’s height, we took it for a spin. It was quite a sight. Everyone ran out of the shop to watch. This rod drops into a metal through-hole in the rear rack. The divot in the rod is for a smaller, sprung rod that is mounted horizontally below the rack itself, and which prevents the attachment rod from bouncing out on bumps. The Roland is by far the nicest trailer-bike I have ever seen, and it boggles my mind that no one is importing it. The custom rack is very heavy-duty, and at the rear there is a metal through-hole welded to the rack itself. 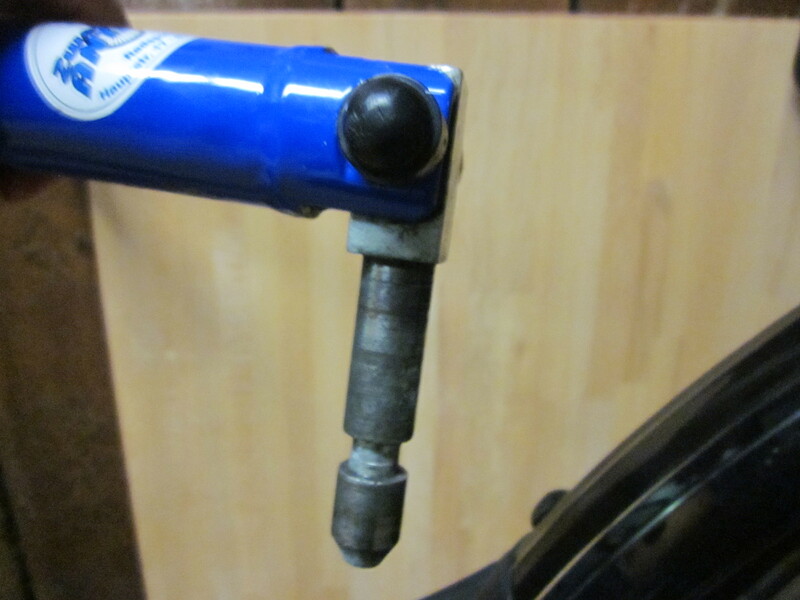 A rod points down from the latch-point of the trailer bike, and slips into the through-hole. It locks into place where a second rod springs into a divot on the side of the attachment rod to secure it. Although the weight of the trailer-bike alone would probably hold everything in position, the extra attachment-point makes it even more secure. (This is all very hard to explain in words; check out the pictures for details.) Once in place the trailer-bike can rotate through turns because the rod turns inside the through-hole. Matt tried out riding the Breezer with the Roland add+bike–this is the end of the Wiggle (the unpleasant part). As mentioned, the Roland is pretty plush by American standards. A chain guard and fender are standard. There are lots of accessories available, including a kid-sized rear rack for panniers, not to mention a cargo kickstand for the trailer-bike itself, as well as extra metal mounts—as this part is small and cheap to ship overseas, we are already thinking of ordering one and drilling a hole into the Kona MinUte’s deck for it. Why not? Our son loves this trailer-bike. He is thrilled to be pedaling without the stress of dealing with traffic, and with, let’s face it, with an adult power assist to get him up the hills. So overall: we adore the Roland. I would suggest that anyone who is interested in a trailer-bike and who has access to a willing German get one. Apparently they’re cheap right now on German eBay. But I realize this isn’t the most helpful suggestion. It’s like suggesting that someone take their preschooler to school on an authentic Japanese mamachari. It is wildly unlikely that anyone who doesn’t have my recent phenomenal bicycle luck could find either one. At the same time, given the reaction I’ve gotten to both, it astonishes me that there are not already dozens of entrepreneurs rushing to import them. Last but not least, the Roland has done something I didn’t think was possible. It has made my Breezer look cool. I have accepted that the Breezer is the least visibly impressive of all our bicycles; it has been compared to a vacuum cleaner, and this was not intended as a compliment. Yet I appreciate its practicality, and I ride it more than any of our other bicycles. 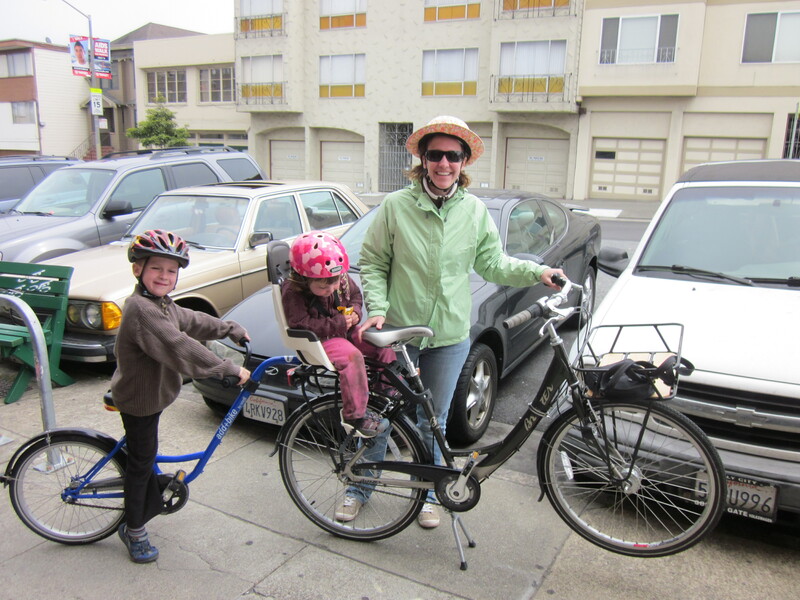 For the first time ever, though, when I was riding the Breezer loaded up with a rear child seat and a trailer-bike in my own personal parade, people shouted “Cool bike!” as we rode by. And it was very sweet to have our most underrated bike finally get the appreciation it deserved. The Add + Bike is also available in the UK. Just wondering if you know the actual weight of the Add+Bike and rack? There is a review (http://www.bikesandtrailers.com/Components/PDF/VV48_Add+Bike-FollowMe.pdf) of the Add+Bike which states 6.55kg for the Add+Bike and 2kg for the rack. But then suppliers are telling me it’s 14kg all up? Any help on this would be much appreciated! Thanks. Lucky duck! I really, really want an add+bike, but they are really hard to find. I do have a question – do you know if the Bobike Maxi is the only seat that works with the Roland rack? Or would other rear seats be an option? Thanks! I think that a Yepp Maxi should work. It’s possible that some of the rack mounted seats could work as well, as long as they left the last two inches of the Roland’s rack uncovered. The main issue we found is that that much weight on the back can be very tough on a regular commute bike. One of the workhorse Dutch bikes would probably be your best bet for a setup like this. I know we’re very lucky! The whole business was a series of fortunate coincidences from start to finish. I’m stuck between a WeeHoo for 2 passengers and an xtracycle. I think that the kids would like the WeeHoo, and the big would like to be able to pedal. But I’d have to get a rack and panniers to hold all of our daycare and kinder and work stuff. If I got the xtracycle, I’d have to buy a ton of accessories, but I’d have cargo space. I could carry the kids bikes on the xtracycle, right? Thoughts? We’re biking in Austin. They make Weehoos for two passengers? That sounds fun, but maybe awkward. Our friend with a single Weehoo gave up riding after a while because it was so heavy–to be fair there are a lot of hills around here. She ended up very happy with an EdgeRunner. 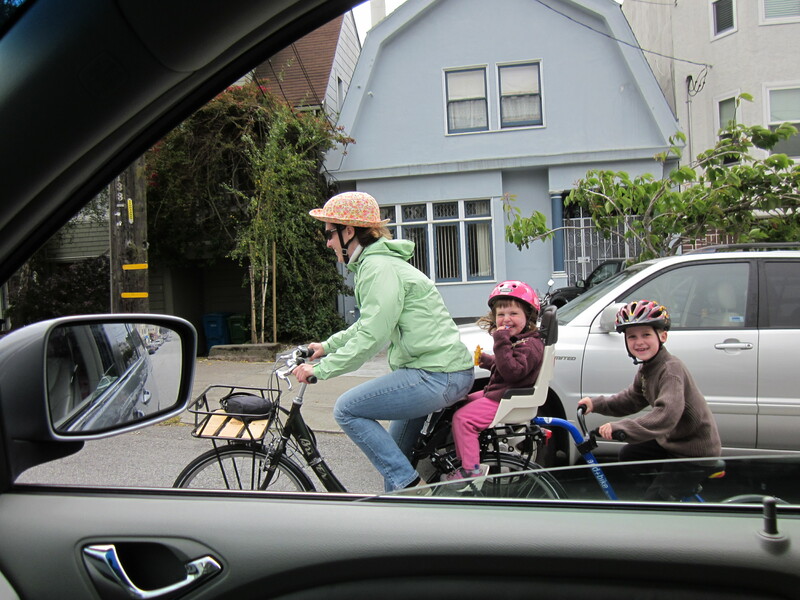 For how to carry kids’ bikes on an Xtracycle frame, check out Family Ride’s blog! I think she’s carried 3-4 kids’ bikes at once, plus kids and other gear. She’s been (favorably) compared to homeless people with all the gear she can put on her Big Dummy. Hiya, I found your blog when looking for info on the add+bike, and saw that you mentioned buying extra brackets. Could you tell me where I could get one of these? I can find any info anywhere about it. Or if you’ve found another method of mounting one to your kone ute? Great blog btw, I’ve had a good read! They can be ordered online through the Roland website and shipped to the US from Germany. It’s complicated but doable. JC Lind in Chicago is also supposedly selling Rolands, and they might be able to get extra parts for you as well. Gah, now I want one! We’re not too far from Chicago, though. Hi, I bought a kona minute after reading your blog, and rode it for 18 months with 2 kids on-board, it’s been great but my 6 yr old also wants to peddle now, have you tried fitting this to your minute? How would it work? I am told by our bike shop that fitting the Roland to the MinUte is possible, but you would need to order the parts from Germany. 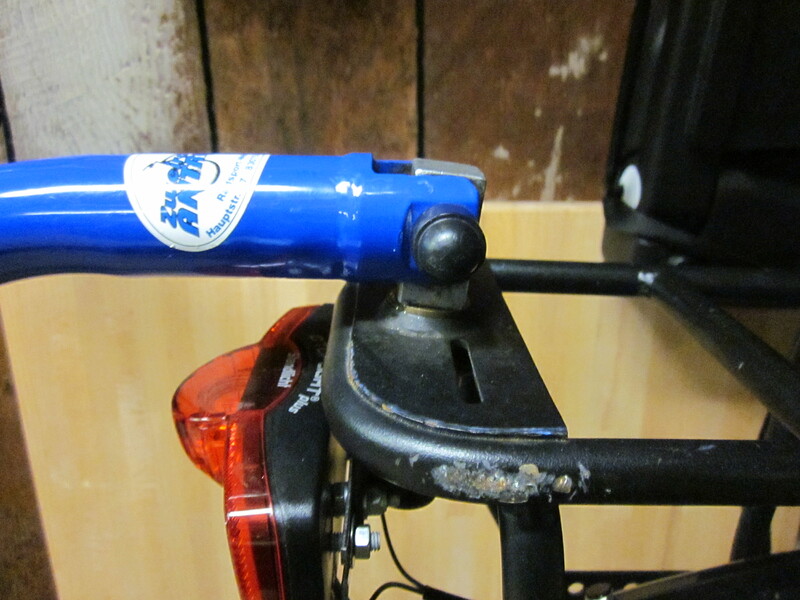 With a willing local bike shop, you would attach a spare rack attachment (from the Roland website) to the MinUte deck. I suspect welding might be involved but our local shop was willing to go there. The rack is a disaster. I bought this bike to travel with kids on long multi day trips. The bike is ok, but the rack is a desater, super heavy, super thick and you wont mount the panniers on it, unless you want to break them. Piccolo would have been much better option even with losing the ability to stack stuff on top. Hi, I have been trying to find out if the pin and screw used for the Roland could be compatible with the Adams trail-a-bike. I basically want to buy the pin set as well as the Roland rear rack, and convert my Adams so that it can become a trailer that attaches to the rack. But this all hinges on being able to use the Roland pin set. The space where the pin would sit is about one inch wide but not sure of the screw size. Any help would be appreciated. Thank you!! I wish I knew, but I have little experience with an Adams so I haven’t the foggiest idea. thank you for the review! I am planning to get one for my 5-and-a-half y.o. avid cyclist. I’d use it to ride to school, but then I can’t leave the trailer there, I’d have to ride further to work with the empty trailer. How does it behave without the child on the saddle?